1. Blacken the insides of tunnels. Use flat black on all interior surfaces - walls, ceiling and floor. There's nothing worse than a beautiful layout with a plywood-colored tunnel interior. Tunnels should be dark and mysterious. If you're using Styrofoam for your mountain, most black paints will attack the foam. Substitute the darkest brown, water-based, acrylic latex paint you can find. 2. Use darker colored ballast in middle of your track. 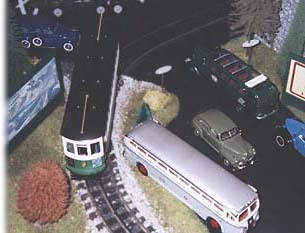 This will help de-emphasize the O-gauge middle third trail (if the rail is black). Most real railroads have ballast which is naturally darkened in the center of the track - from oil drippings. Use darker ballast around tunnel entrances, too. 3. Make grade crossings look real. Use thin black foam, black painted balsa wood, plastic strips (or even tongue depressors - 'painted' with a black Sharpie marker) as inserts to cover the railroad ties at road crossings - giving the crossing a more authentic look. 4. Put operating signals at crossings. Use either a set of crossing flashers or a flasher and drop-arm combo. MTH makes durable, realistic ones. Kids are mesmerized by these 'lights and action' items. 5. Buy tunnel portals. They look much more realistic at a tunnel entrance than a rough cut hole. I bought mine from Scenic Express (the company offers a good selection of portals), then I 'weathered' them with gray-wash, chalk, etc. 6. Make your road vehicles look real. I black-wash the grilles and hubcaps of model cars and trucks to add depth and realism. I also paint taillights, parking lights and door handles if needed with a small brush. Then I take the cars apart and install drivers and passengers. 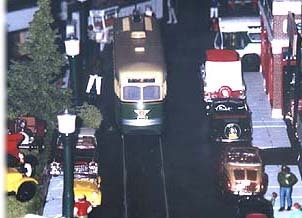 Nothing looks sillier on a layout than vehicles seemingly driven by invisible ghosts! I use 1:48 scale injection molded sitting figures made by Circus Craft. (I purchased mine from York Trains.) The figures come in male, female and child variations and are molded in 'flesh' color. The arms must be attached by gluing, then the figures can be painted. Sometimes, the figures won't fit between the steering wheel and the seat. When that happens, I simply cut the legs off with a pliers and they fit just fine. Use flat (rather than glossy) model paint to make painted clothing and hair look real. Here's a bonus tip from my personal experience - don't try to paint neckties on the little men after drinking multiple glasses of Merlot. 7. Add more people. 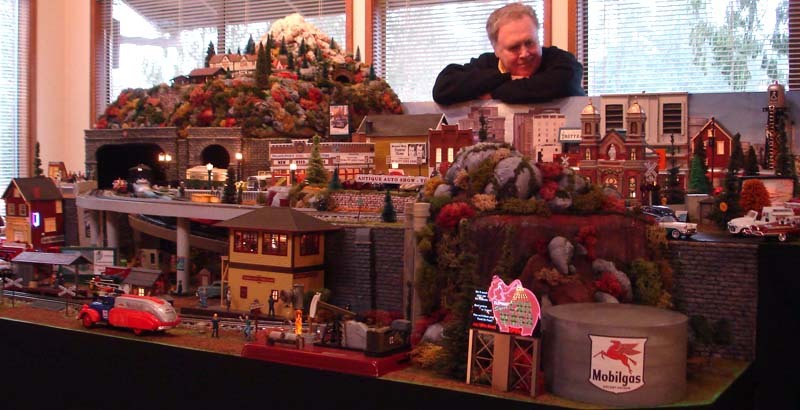 You can never have too many people on your layout. Put them everywhere - on streets, station platforms, walking out of businesses, etc. 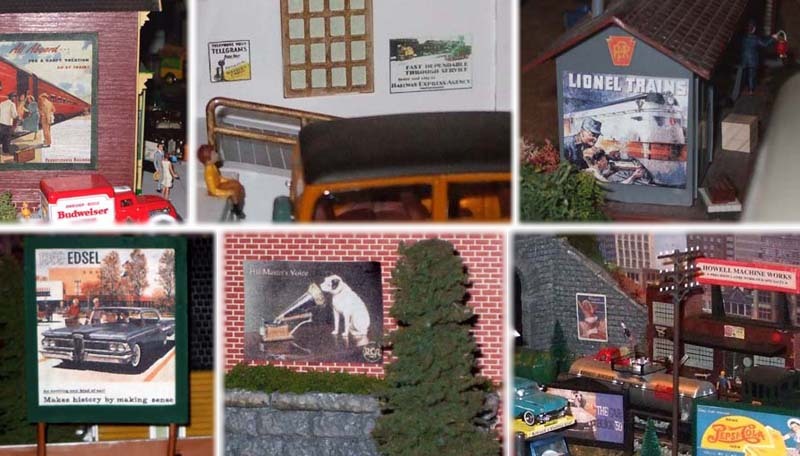 Numerous manufacturers offer 1:48 scale "people" - MTH, Model Power, Preiser, Arttista and many more. Buy a some from each supplier to add variety to your layout. I attach my people to the layout using Amazing Goop. Some plastic buildings look opaque but become translucent when internally lit. Since you want light to shine through the windows, not the walls, cut aluminum foil into properly-sized panels and glue to the interior walls using an ordinary glue stick or Amazing Goop. You can do the same for plastic roofs, too. I sometimes create frosted windows using onion-skin paper glued in place. You can also draw curtains or blinds on the onion skin for added detail. I also recommend the use of eye-catching animated neon signs from Lightworks USA. 10. Be true to your theme. Don't mix eras - putting 1970s billboards in a turn-of-the-century Western theme. Or putting a Lexus SUV in a fifties-era scene. PS - I have no ties to any of the companies I've recommended here and have received no compensation from them. I'm simply a customer who has been pleased with service I've received. All of the companies listed here have websites - you can find them using Google or any good search engine. Best of luck with your own train layout.